The Northern Hardwoods Cross Country Ski Trails are a part of the Seney National Wildlife Refuge. The trails are open to the public and free of charge. There are seven classically groomed Nordic ski trails to choose from providing over nine miles of skiing and snowshoeing opportunities. This is a family friendly environment with trail difficulty broad enough to meet the needs of all user skill levels. Trails are open during daylight hours only and dogs are not allowed providing consideration to all users and to avoid damaging the groomed track. Visitors will find themselves among mixed habitats including; hardwood forest, boreal forest, marshlands, and the frozen beauty of the Manistique River, allowing great opportunities to view wildlife. The ski trails are typically groomed once per week. Snowshoeing is allowed anywhere on the Seney National Wildlife Refuge. If you would like to snowshoe along side the trails you are welcome, but please do not snowshoe on or in the groomed trails to avoid damage to the track. Directions: Follow M-77 to Germfask, Michigan turning West onto Robinson Road at the south end of Germfask. 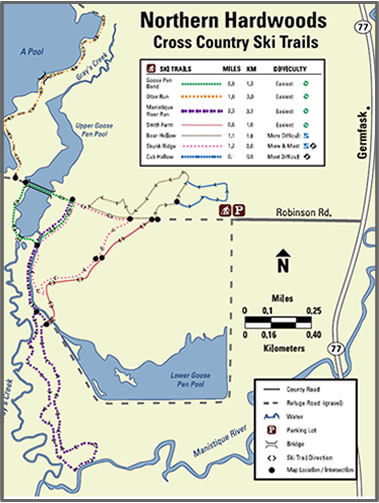 Follow Robinson Road to a plowed parking lot with a kiosk providing a detailed map and brochure maps of the trail system. Additional information can be found on the Seney National Wildlife Refuge website. Goose Pen: (0.8 miles) Ideal for children and beginner skiers due to its short length. Goose Pen offers mixed forests and circles a body of water, allowing for extra opportunities to view a variety of wildlife. Otter Run: (1.8 miles) Otter Run parallels Gray's Creek and the A Pool of the Refuge on a flat long path, providing a wide scale view of the expanse of the Refuge and a feeling of solitude. Manistique River Run: (2.3 miles) Recommended for skiers interested in viewing wildlife, this trail winds along Gray's Creek and the Goose Pen Pools connector creek until meeting up with the Manistique River. Open water areas, varying forest types, and marshlands along this trial can provide wonderful wildlife viewing opportunities. Smith Farm: (0.6 miles) Smith Farm trail allows skiers to travel through a hardwood forest and make connections for several alternative routes before returning to the parking lot. Bear Hollow: (1.1 miles) Skiers that are ready to step it up a notch to enjoy some hill action, can meet the needs by skiing Bear Hollow. Winding through hardwood forests and marshlands can be even more enjoyable while gliding with the long gradual downhills offered by this trail. Skunk Ridge: (1.2 miles) Skunk Ridge is suitable for skiers seeking hilly terrain with challenging corning. Uphill sections are less steep than the downhill sections making this trail ideal for length, variety in terrain, and a challenging workout. Cub Hollow: (0.5 miles) Hilly and fast, Cub Hollow is a forested trial for advanced and controlled skiers who like the challenge of waddling up hills and cruising down the other side.